There are certain things that simply do not go well together. For instance, I maintain that combining sweet and savory is generally a bad idea. I know, I know, there can be some exceptions such as hot and sour soup, raspberry vinaigrette or apples and cheddar cheese. But chicken a l’orange or turkey with cranberry sauce simply doesn’t do it for this foodie. The same can be said for people too. It probably wasn’t a good idea to pair Charlie Sheen with Brooke Mueller, Chris Brown with Rhianna or George W. Bush with the United States of America. In the car world, there’s the failed partnership of Volkswagen and Suzuki and Ford and Mazda for example. Perhaps the biggest example of automakers that probably should not go together, though, was when Chrysler and Daimler got together. Daimler was the maker of Mercedes-Benz. And as it turns out putting German engineering with American interior and exterior design was as brilliant of an idea as getting Mike Tyson to babysit your kids. It just turned out to be awful. In fact, it was so bad that Chrysler and Daimler finally put themselves out of their misery by separating for good in 2007. But the idea of merging an American brand with a European brand didn’t necessarily sour the taste buds of the Italians. Fiat aligned themselves with the brand in 2009, partly to take advantage of the mass dealer network already set up in North America by Chrysler in order to re-enter the market. 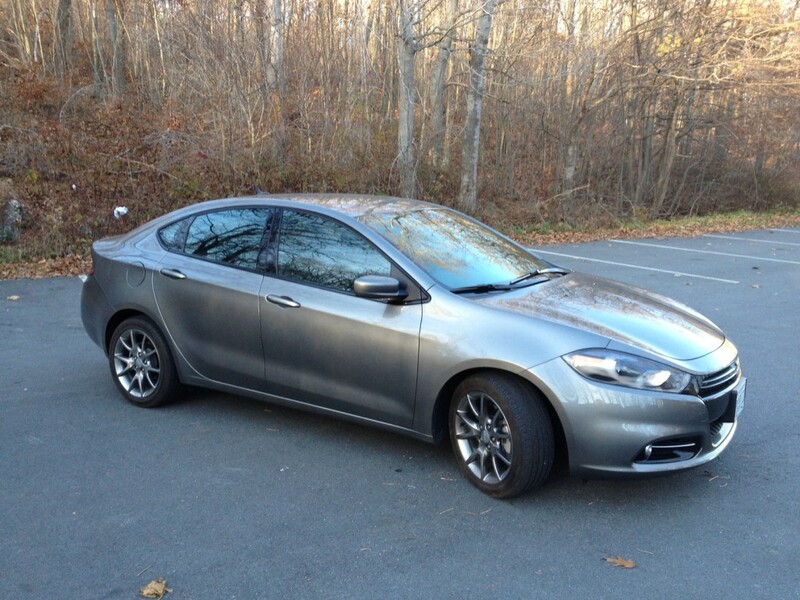 And now we have the first Italitan-American creation in the form of the Dodge Dart. While Chrysler insists that it is not a replacement for the awful Caliber, it’s going to have to play the role for the time being until they get themselves a proper hatchback. Does this Italian-American fusion have what it takes or will it turn out to be just another one of those things that just shouldn’t go together? 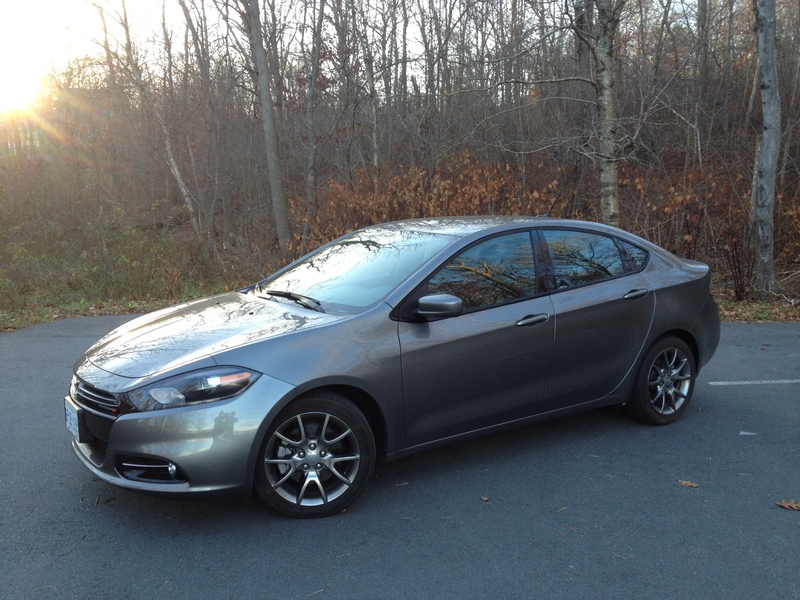 When Dodge first debuted the Dart, my feeling on its style was that it looked underwhelming. I thought the shape was too generic, the front end too bland and its overall stance to be awkward. However, in seeing it in person, and especially in my tester’s Rallye trim, I now find it to be decidedly eye-catching. In fact, the car generates a lot of stares not least of which was from a woman who almost gave herself whiplash as she walked by and had to double back to take a closer look while it was parked on the road. The 17 inch alloy wheels are nicely styled and while I find the wrap around LED tail lights a bit much, they also generate attention (however you need to go to the Limited trim level to get the entire set of tail lights to light up). In addition to unique alloy wheels, the Rallye pack also ads a unique black front facia, black headlamp bezels, a leather wrapped steering wheel, cruise control and dual exhausts. Chrysler has been working quite hard on improving the interior layout and quality and I have to say, it’s quite obvious that they took the time necessary to get the Dart’s interior right. 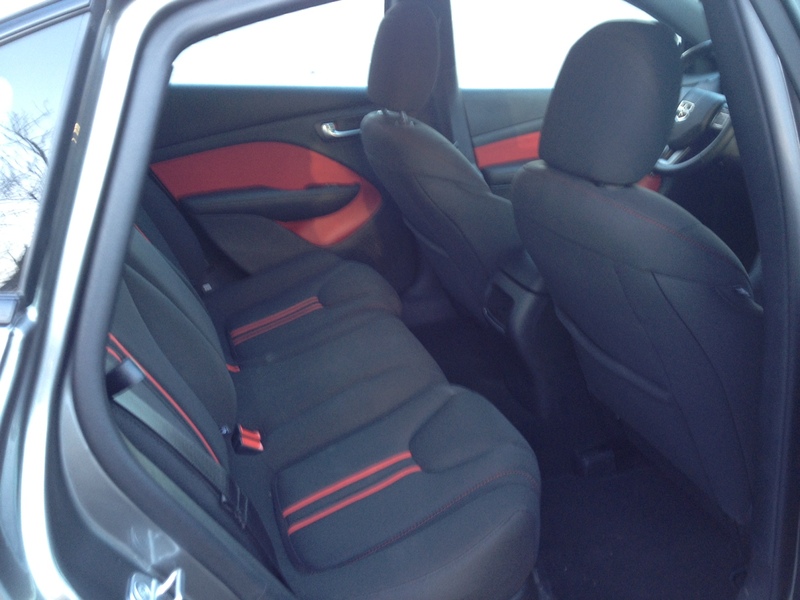 It’s well appointed and has the type of attention to detail found in some Volkswagen interiors. The 8.4 inch centre display screen is very easy to read, my only gripe is that the screen should dim at night. It was quite bright and a bit distracting when it got dark. Speaking of distracting, the gauge cluster design has got to be one of the most difficult to read in the business. The numbers are small and the indentations are bulky and awkward. Matched with the red and white colour scheme they are difficult to read at first glance. Dodge also incorporated a red strip which spans around the dash which circles around the centre stack (mimicking the tail lights) and it lights up. This is just some of the typical American brand tackyness that turns me off, but it did seem agreeable to most women. I could also do without the red inlays and stipes on the seats, but again to each their own. But the biggest thing to take away from this interior is that Dodge has stepped up its game and its now on par with most of the higher quality materials in its segment (save for the visor over the gauges which I’m sure a baby could rip off on the first try). I really like the hidden cubby hole under the front passenger seat and the overall abundance of nooks and crannies to store most of your stuff. Cargo room is good as the Dart has a large trunk, and cargo area increases with the seats folded, however the pass through from the seats is a bit narrow. Rear legroom is a bit narrow for taller passengers, but head and shoulder room is good. The Dart comes with three engine choices, but if you go with the Rallye edition you’ll get the same 1.4 litre Multi-Air turbocharged engine found in the hotted up Fiat 500 Abarth. This power is rated at 160 horsepower and 184 pound feet of torque. The end result is absolute torque lag. Seriously, it’s pretty bad. The last time I drove a car that did nothing after having your foot to the floor for literally three seconds was in a 1999 Saab 9-3. This makes turning left into oncoming traffic quite a chore. There’s nothing quite as frightening as seeing an opening in traffic, making the turn and then nothing happens as headlights quickly barrel down at you. 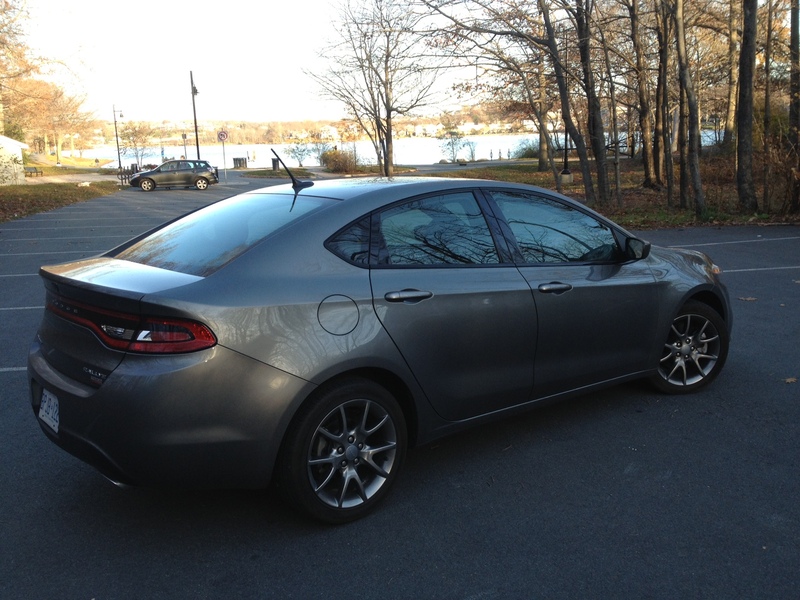 However, once the engine revs to about 3,000 RPM, the Dart will take off like a slingshot and power stays just before red line. Make no mistake though, I’m not necessarily saying that this turbo lag is a bad thing. This car is a screamer through and through and that’s half the reason why this car is so fun to drive. Not only that, but it really gives this car some character – some Italian character to be precise. Most low-end Italian cars need to be revved to red line in order to get them moving and as scary as that can sometimes be, it’s quintessentially an Italian. And as I found out this summer, that is one of the many things that gives Italian cars their soul. However, in keeping with that same theme, the Dart also has a clunky shifter with long throws just as an Italian car does and the clutch is a bit on the light side. But the exhaust note sound is unlike anything I’ve heard in a non-tuned $20K vehicle. It’s throaty in low to mid range and when you hit the higher RPM range it doesn’t sound whiney like most of its competition does. At the end of the day, this car probably has the most character out of any of its competition. 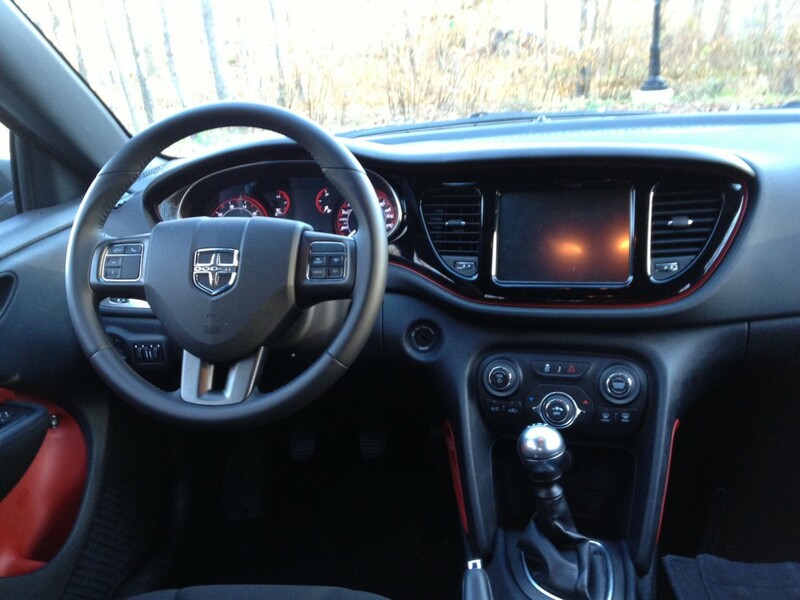 It offers very good performance despite no low end power and a clunky shifter. 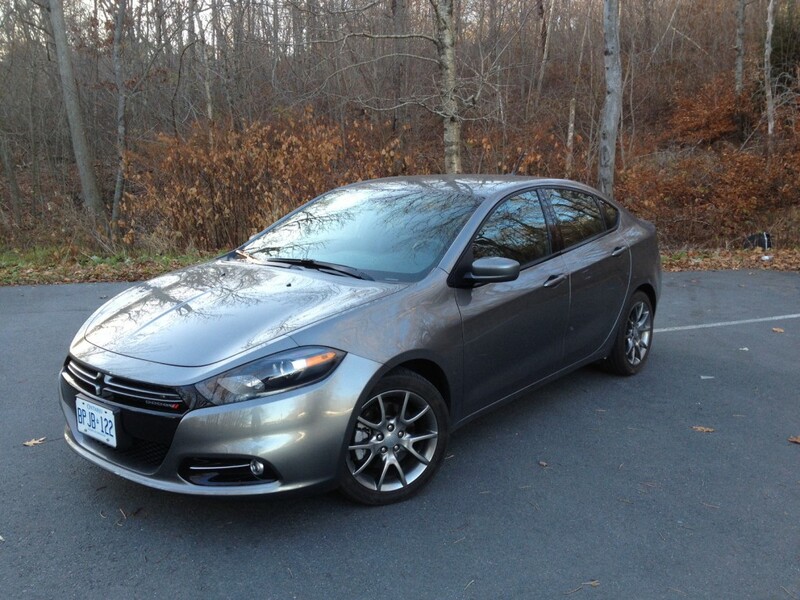 The Dart returns decent fuel efficiency too. 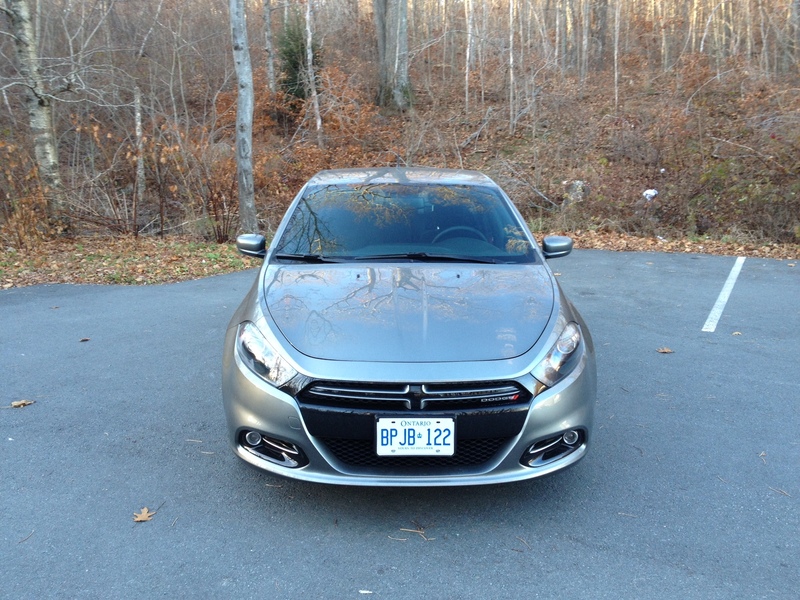 Rated at 7.4 L/100 kms city and 4.9 highway, the Dart won’t have you rushing for the pumps. I originally thought this to be untrue because you end up revving it more often than not to get that power, but despite me doing this, gas consumption was still respectable. 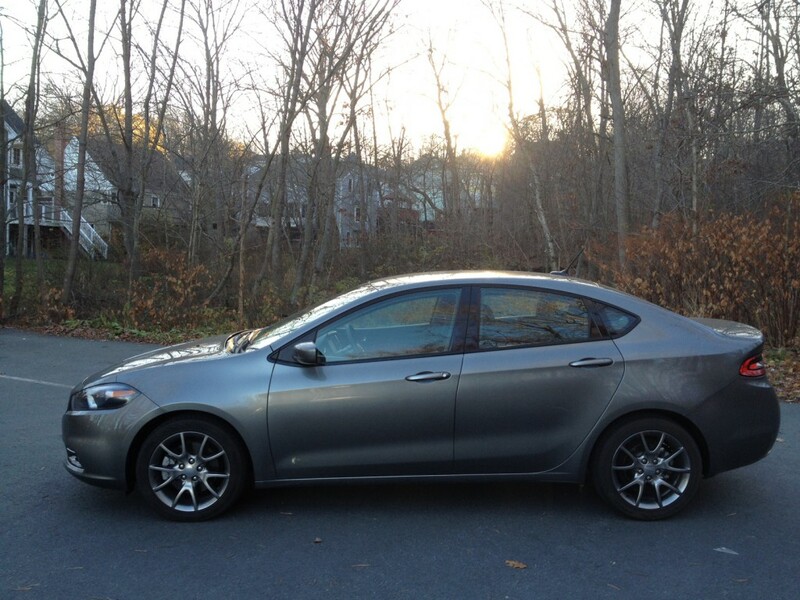 As for handling, the Dart surprises again. It’s confident, there is little to no under steer and it feels well planted. It’s been a while since I’ve driven a car where I felt so confident in the handling abilities that I would take corners without braking 90% of the time, but this was true in the Dart. The new ZF electronic steering is well weighted and direct, in fact I’d wager that it has the best steering feel out of all its competitors. This matched with with its handling abilities means you can toss the Dart about with good fun and a grin on your face in return. So, the conclusion? If this is what the Italians and Americans can come up with when they put their heads together, then they need to hurry up and do it again. I can honestly say this is one of the funnest cars to drive if you’re on a budget. When I tested the German-American marriage that is the Durango, I called it the best Dodge I’ve ever driven. Unfortunately I’m going to have to take that crown away from the Durango and pass it along to the Dart.